Looks can be killer , and what can best describe this quote than the new Aventum II custom performance PC . The new Aventum II is a handcrafted masterpiece of art and technology . Take a glance at it and you’re sure to be mesmerized by its beauty and aesthetics . If you are into high end PC gaming , your search ends here for the best performance gaming PC you can get your hands on . 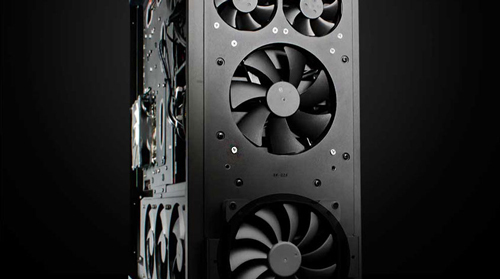 The Aventum II is absolutely a mind blowing beast of a machine , This hand crafted masterpiece was designed and created by Digital storms’s in-house team of engineers from scratch with their own custom cooling system , to offer the best gaming experience to gamers . There’s every one of the top notch gaming Hardware you could ever dream of . All put together into a one of a kind gaming beast by the in-house team of engineers at Digital storm . The build also includes their own ultra efficient cooling system . It might be seen as a overkill but it is something that you can seriously brag about . The System is powered by 3 NVIDIA TITAN in SLI , When even the most graphic intensive game can be handled by a single NVIDIA TITAN , imagine what 3 of these paired together can do . If you think the above configs are not up to your taste , Digital storm give you further options to customize your own personal configuration . The Aventum II is The worlds most advanced performance PC available now . 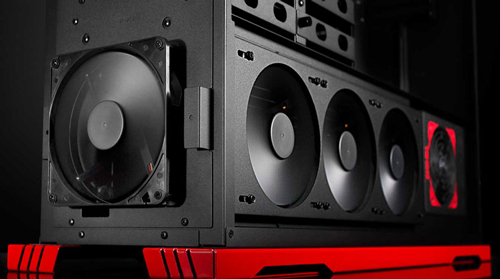 Digital storm has built this PC taking care of all the extreme needs of all the gamers . There’s more juice in this PC than you can squeeze out of it . It can easily be set up with a tri monitor gaming setup and will run every game that you can throw at it just like a breeze . The Aventum II was designed to ensures zero bottlenecks and maximum performance from the hardware . It monitors thermals from multiple strategically placed temperature probes and automatically regulates its 22 chassis fans accordingly. for gamers with advanced needs they have also provided a specialized software for cooling and lighting systems, directly accessible within Windows. 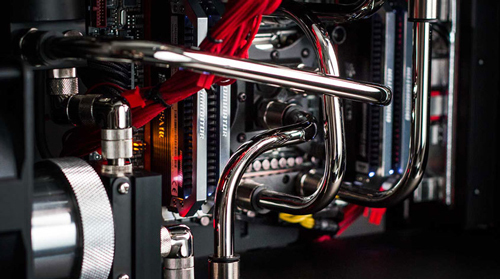 a custom nickel-plated copper piping solution ensure better cooling inside the PC . To prevent heat buildup, the Aventum II features a patent pending unique exhaust chamber design which isolates performance diminishing heat from core system components and routes it to a dedicated rear exhaust vent. 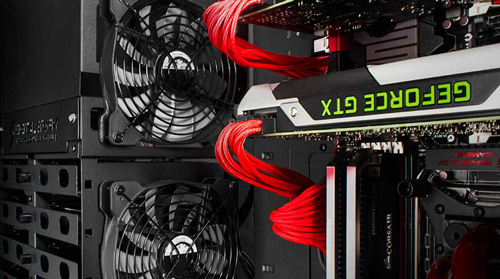 Cost wise this performance gaming system will burn a deep hole in your pocket . It can only be affordable by the ultra rich unless you come up with an plan to rob a bank or something similar . The Ultimate edition Aventum II costs a whooping $10,000 ( that’s exactly Rs.5,94,880 in Indian rupees ) . 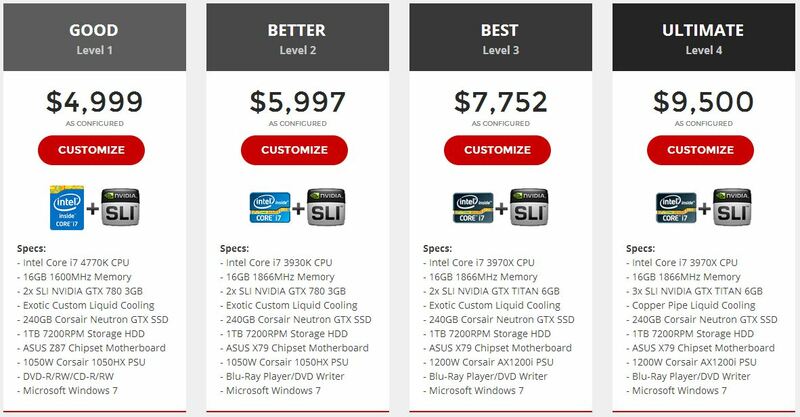 But with less than the half of that money you can assemble a better PC yourself . The price can simply be justified by the level of hand craftsmanship demonstrated by the digital storm team . Hats off to them for this great build . If you want to get your hands on the Aventum II . either you can start saving up or you can choose from 3 of the other builds with prices starting from $4,999 ( Rs.2,97,380 and still not affordable 🙁 ) Click here . 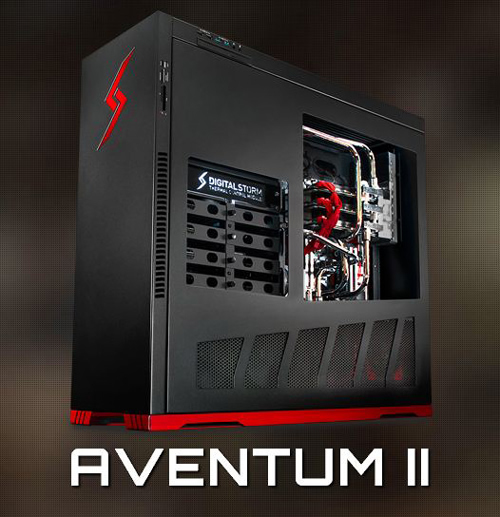 The Aventum II is really a class apart from the current custom performance PC available t now . Even Alienware is bound to shy away when it compares its offerings with the Aventum II . Rest assured all your moolah spent on this beast is well justified by what it can offer . For the money you spend you get the best system config, great support from digital storm and last not the least you got the rights to brag about . Do take it to a LAN event and just get amazed by the responses . For us we will just admire it from here . What do you think about the PC ? are you willing to buy it ? do share your views on it in the comments .